NEW England sheep and cattle breeder Martin Oppenheimer states why he believes Australian Wool Innovation should not start nor be even a part-owner in its proposed Wool Exchange Portal. 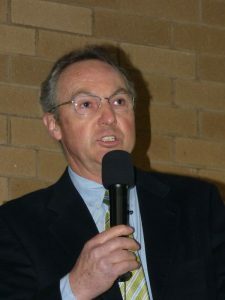 Mr Oppenheimer is a past chairman of the Australian Wool Growers Association and AWI’s Wool Carbon Alliance. He has 37 years’ experience in the wool industry. The proposed Wool Exchange Portal has created good discussion in the industry on the important topic of cost of wool selling in Australia. Australian Wool Innovation has done the right thing to fund this research, but AWI must not start and own the WEP as new wool industry body. Firstly, the government-backed, compulsory levy funded, non-commercial AWI model should have no role in Australian wool supply. AWI and its previous incarnations have a disastrous history of market interference. The reserve price crash in 1991 and stockpile hangover until 2002 created market distortion that we are still dealing with today, ie. too much broad wool, not enough fine wool, then too much fine wool. Then in 2004, AWI started legal action against a foreign animal rights group and promised, but failed, to deliver research outcomes. This smashed confidence throughout the wool pipeline, lost growers and lost wool production. Secondly, AWI has no history or track record of commercial success. It is not a commercial organisation. Thirdly, starting wool industry bodies is the easiest thing to do. Killing them off is the hardest thing; which we have done several times, but they usually morph back into something similar. The latest example being the Graziers Investment Company, the remnants of IWS and Woolmark, which refuses to die. It appears that the directors and staff like their entitlements and superannuation. Who cares about the poor growers who have provided the funds? If the WEP has commercial merit, then AWI should hand the research and concept over to commercial parties. There may be a place for royalties or an income stream for the intellectual property if successful. But having AWI ownership and AWI directors sit on the board of the new WEP — here we go again. It is worth noting that leading wool industry analyst Mecardo said the WEP projected industry benefit is “small beer” at about 1 percent of the selling costs from wool store to mill, or 0.1pc of the average bale value of wool sold during the past three years. This compares with the cost of wool harvesting at 72pc of direct costs to growers from sheep’s back to mill, in 2009-10. It begs the question why AWI stopped reporting ‘sheep’s back to mill’ costs in 2009-10? Was it not worthwhile for “transparency” to report the 5pc cost of Levies to growers? There’s a bigger saving than the WEP. Also alarming is the concept that all growers will pay for the AWI WEP, whether they use it or not. Growers who sell wool direct will have higher costs, which is simply wrong. The wool industry must not be misled by meaningless jargon such as “creating market tension”, “game changer”, “digital platform” or “adding transparency”. How can a 1pc saving of selling costs be a “game changer”? If AWI is to add value to the modern Australian wool industry it needs to be updated. This means not creating more non-commercial, government-backed, compulsory grower levy-funded bureaucracies. It could be self-funded by shareholders and users of its services. If AWI was a commercial body, then it has every right to be involved in wool supply and it could start all the digital platforms it needs. The template for modern wool and sheep services exists now in the market; they sell branded product, their growers have three-year forward contracts for their wool and lamb, if they want. They focus on product quality, perception &amp; reduced cost of production. They compete against us without government backing and compulsory levies, now that would be a “game changer”. A quote from legendary wool grower, author and historian Charles Massy from his 2011 book ‘Breaking the Sheep’s Back’ is very relevant today. The book should be compulsory reading for anyone considering Australian wool’s future. I like the way Andrew Farran’s thought process works. Good points. But we don’t want to slip from the frying pan into the fire. The wool selling system must have statutory elements for assurance and governance purposes. This should underlay the system, not control it. As for control: this is the rub. If money alone could secure that, then control may be lost to foreign, and not impartial, interests. So what mix of stakeholders would secure the objective? Do wool growers and partners have sufficient depth of capital to handle this? Here, here Martin. And isn’t it time more growers stood up for your plea for the return of our industry to commercial reality and the end to statutory interference by AWI and it’s wasteful expenditure of growers hard-earnt income on another dodgy marketing venture? Well said Martin. One could reasonably extend you argument to suggest that wool’s downhill slide has been mainly attributable to the levy model of wool marketing and research. It’s time the free market was allowed to operate and the levy cease to exist.